Hycarus is a registered trademark in the United States and Europe. We are committed to provide our customers with high-quality products and quality after-sales service. If you are not satisfied with our products and services, we will provide you with a satisfactory solution after contacting us. 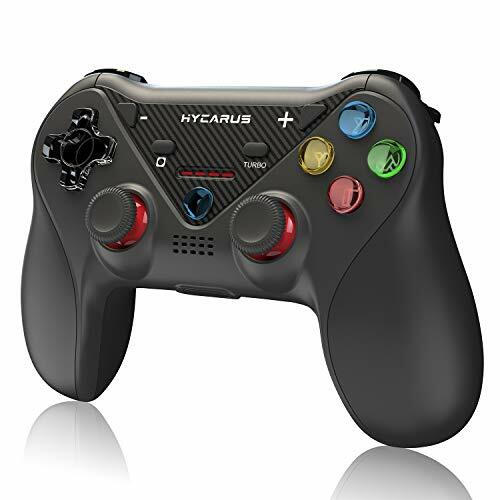 This Hycarus Nintendo Switch Pro Controller is compatible with Nintendo Switch, Android & PC (XInput & DirectInput modes) platforms. The gyro sensor is an easy-to-use free-space movement and gesture-based positioning and control system. Waving the gamepad on an imaginary plane, the corresponding character on the screen will follow. When you are playing Nintendo Switch games with this premium Nintendo Switch Motion Controller, these operations can be easily implemented. Hold on the TURBO button, and then press one or more action buttons, the corresponding action button will have a continuous function. The turbo function is particularly suitable for arcade and action games, such as dueling, airplanes, wrestling, boxing, etc. Nintendo will occasionally upgrade the Nintendo Switch console system. Sometimes it may be not possible to use this controller temporarily because of this reason. If you encounter this problem, please contact us in time by email. We will send you an upgrade file and detailed operation steps, and the upgrade procedure is very simple. If you are more concerned about this, we strongly recommend that you choose the official Nintendo Switch controller, because only the official controller will not be affected by the system upgrade. Built-in Gyro Sensor: the built-in gyro sensor can accurately transmit each of your moves to the characters you play, allowing you to experience the excitement and fun of the motion control games. This Nintendo Switch motion controller supports ARMS, Mario Kart 8, The Legend of Zelda, and all other best seller games. Useful Turbo & Dual Shock Functions: turbo's continuous shooting function makes it easier for you to play arcade or action games. The dual shock feature lets you quickly enter the game character and allow you to enjoy an immersive gaming experience. Full Compatibility: this Bluetooth controller is fully compatible with Nintendo Switch, Android and PC (XInput & DirectInput modes) platforms, and the connection method is very simple. Whether indoors or outdoors, you can enjoy the Nintendo Switch games anytime, anywhere! More Scientific Ergonomic Design: grip texture around sticks and handling on this Nintendo Switch Pro Controller have been improved to fit a wider range of hand sizes easily. Soft leather on both sides of the handle will prevent sweat from feeling uncomfortable while playing long time games. Money Back Guarantee: if for some reason you're not happy with this Nintendo Switch controller, we'll make it right and process a refund for you soon. Your satisfaction is not an option, it's a guarantee! If you have any questions about this product by HYCARUS, contact us by completing and submitting the form below. If you are looking for a specif part number, please include it with your message.